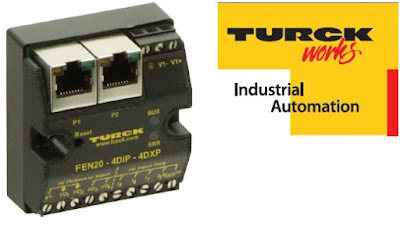 The new compact Ethernet multi-protocol I/O modules from Turck make standard switching signals quickly and effectively bus-capable. The FEN20 devices with digital inputs and outputs are immediately ready for use in Profinet, Modbus TCP, or Ethernet/IP systems, thanks to their multi-protocol plug-and-play functionality. The FEN20 detects the protocol used by listening to the communication traffic during the startup phase. The FEN20 devices are available in two different designs. The small 4DIP-4DXP fits in small control boxes, control panels, or other existing housings. They can also be retrofitted to make push buttons and LED indicators quickly Ethernet ready. The large 16DXP is designed for the same type of application and provides up to 16 I/Os. It can be operated both as an input or output as a DXP variant. The module also provides the division of the I/O-signals into three independent potential groups which are isolated from each other and can be centrally controlled.